Any financially savvy person knows how important it is to save. However, when most people think of saving, they think of that rainy day fund that everyone is always talking about, the one that you would only use in an emergency situation. Although having an emergency fund is a must, you most likely have other financial goals you’d like to work toward, and certain goals may have priority over others. Considering your financial aspirations, the question has to be asked: Why would you lump all of your money into one savings account when you’re trying to reach five different finish lines? Instead of possessing a sole savings account for stashing your money, you should open an account for each financial target. Here are six reasons why having multiple savings accounts is financially beneficial. As I’ve already mentioned, you most likely have more savings goals than just creating an emergency fund. Maybe you’d like to save up for a house, a car, or that vacation you’ve always dreamed of. With one account, you could not only forget what you were saving for to begin with, but you could forget how much you wanted to save and have saved for each goal. When all your savings is in one lump sum, things can get a little fuzzy, and that makes it that much harder to work toward each of your goals. Furthermore, even if you’ve decided to contribute a certain amount to each goal every month, by having it all go into the same account, those amounts just get mixed up, and you could forget whether or not you’ve added to that account for each of your goals in any given month. Having one account doesn’t give you any clear vision of your financial goals, which makes reaching them seem impossible. When your money is combined, $5,000 can seem like a lot, but if that $5,000 has to be divided between six different targets, then you’re not quite as close to your goals as you may think. Having all your savings in one large amount gives you the illusion that you’re making great progress towards your goal even if you’re not. In fact, you may even get a little ahead of yourself and think you have extra money to spend that you really don’t have. A friend could invite you on a vacation and mention that it’ll only cost $3,000. Well, if you have $20,000 in your account, you may feel comfortable forfeiting that small amount. However, if you’re saving for a $25,000 car, you just set yourself back quite a bit, especially if that $20,000 was already divided between various goals already. Not all financial goals are created equal. There’s usually certain goals you’d like to achieve first and that you’d like to fast-track over others. Would you rather go on your dream vacation first or put a down payment on a home? The argument for having separate saving accounts is that they allow you to clarify your goals and exactly how much money you’ll need to achieve them. It gives you a clear vision for distributing any excess income by allowing you to see all of your goals so you can divide accordingly. Then, once you’ve reached one goal, you can easily shift extra money into your other accounts after you decide which goal you want to achieve next. Multiple accounts allow you to prioritize and make adjustments accordingly. Having only one account shows you one picture, leaving you in a jumbled mess. It can be difficult to know what the best bank or savings account is right for you depending on what you’re saving for. Some banks offer better interest rates, others may give you a bonus for merely opening the account, and some may have pesky fees. Furthermore, there may be certain banks and accounts that are just better to deal with, and some may give you tools to manage multiple accounts. By opening a accounts at different financial institutions, you can get a taste of a few different packages so all your accounts aren’t stuck in one spot. One of the hardest things about having a well-stocked savings account is the temptation to withdraw money from it when your favorite store has a sale or a new item came out that you just have to have. As I mentioned earlier, one savings account can give you the illusion that you have a lot more than you do, so you might feel more comfortable making a small withdrawal than you would if you saw the actual amount you have allotted toward various goals. Moreover, if the only savings account you have is with the bank your checking account is at, then there’s usually no fee or delay when you want to transfer money, making dipping into your account that much easier. Even if your accounts are all at the same bank, you’ll be much less likely to take money from an account that has a specific purpose, which will keep your savings on track. 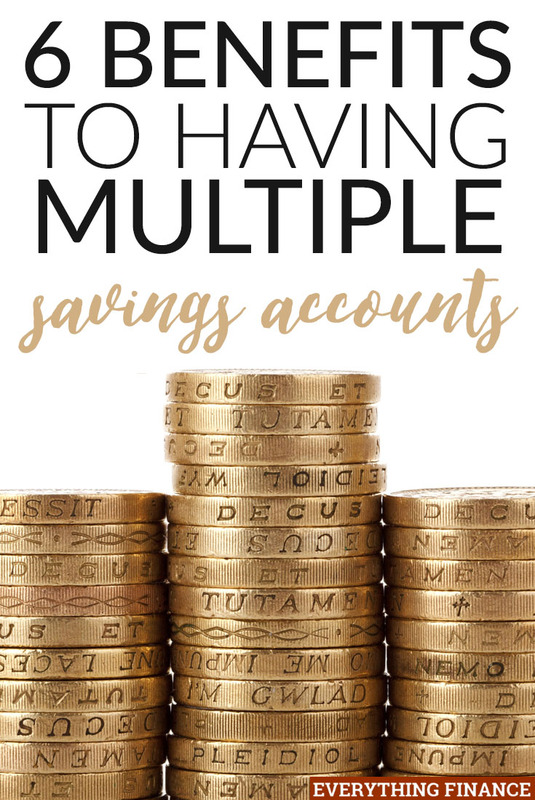 Multiple savings accounts could get complicated if you open too many, but the benefits far outweigh the drawbacks in my book. You’ll be able to clearly see and track your progress for all your financial aspirations, and at the end of the day, will most likely reach those goals much quicker. One savings account leaves room for too many questions and confusion. Possessing multiple accounts will keep you from spending what you don’t have and put you in great financial shape. Do you have multiple savings accounts? How do you divide extra income?